Kevin Harvick went from playing the blues after Friday's truck race to rocking the NASCAR Nationwide Series Nashville 300 event. Driving another outing in his Kevin Harvick Incorporated #33 Chevrolet, cross the finish line first for the second time in the early 2010 NASCAR Nationwide Series. The #20 Toyota of Joey Logano clinched the pole in qualifying for the Nashville 300 leading the Nationwide Series field with Kevin Harvick's #33 Chevrolet starting alongside. Unlike the rather dull Camping World Truck Series event, the Nationwide Series race provided a much more eventful competition. With 8 caution breaking up the action, the a major collision occurred when the field regrouped after a previous yellow flag period. On the double-file restart, multiple drivers saw an opportunity to advance their positions. Dicing three-wide and later four-wide for spots on track at lap 113, the four-wide scenario proved unwise as Brendan Gaughan, Steve Wallace, Mikey Kile and Jason Keller entered turn three. With the #62 Rusty Wallace Racing Toyota of Gaughan hugging the apron as the track, teammate Steve Wallace drifted high tangling with Mikey Kile and Jason Keller. With Michael McDowell and the Roush-Fenway Racing driver Colin Braun also collected in the massive incident, the debris field of auto parts necessitated a red flag stoppage for over 14 minutes to clean up the turn 3-4 segment of the Nashville Superspeedway. Climbing out of his battered #66 Toyota under his own power, Steve Wallace could be seen hobbling in pain to the Ambulance and out of the in-front care center. On the #66 driver's twitter page, Wallace stated "Man that wreck hurt like hell". The cars of Wallace, McDowell and Keller were all retired from the event immediately after the crash. Not anyway as severe as the lap 113 crash, two caution periods involved the dramatic exploits of two drivers. On lap 43, the #1 Pheonix Racing Chevrolet of James Buescher made contact with the #38 Great Clips Toyota of Jason Leffler through turn 2. With the #38 spinning into the wall, it took numerous laps before the Great Clips Toyota returned to competition. While the incident appeared largely unintentional, Leffler returned to the race track under a different impression. Heading down the frontstretch on lap 143, the damaged #38 Toyota pinched the #1 car against the wall in retaliation against Buescher. The latest in on-track feuds in NASCAR, this incident comes after the two-race exchange between Brad Keselowski and Denny Hamlin at the end of 2009 NASCAR Nationwide Series. Still fresh in many race fan memories, the on-track skirmish occurred at the Atlanta Sprint Cup race where this time Keselowski caught the ire of Carl Edwards. For the Nashville 300, NASCAR officials dealt with Leffler the same way they addressed Edward's payback, parking the #38 for the duration of the event. On Jason Leffler's twitter page, the driver posted after the race "Got crashed 40 laps in to the race! 38 great clips car was fast! Then all hell broke loose! Damm". Under green, the Joe Gibbs Racing #20 of Joey Logano gave his Game Stop sponsor some valuable representative. Holding the top spot for 122 of the 225 laps at Nashville, Logano never gained ground after a final pit stop. Logano finished 8th in the race despite the speed he showed throughout Saturday. Through closing laps, Kevin Harvick and crew chief Ernie Cope chanced a two-tire change as an advantage to gain track position. The gamble paid off as the #33 Chevrolet was able to repel the Joe Gibbs Racing Toyota and Penske Racing Dodges. The final laps had the Braun Racing #32 Dollar General Toyota driven by Reed Sorenson mounting a charge on Harvick. Taking the runner-up position, Sorenson's hard-fought effort came short of a victory which Dollar General pledged would amount to a $50,000 donation to Autism charities. Third place went to Nashville's Camping World Truck Series winner Kyle Busch. Eager to complete a sweep for the Nashville Easter weekend festivities, Busch commented that his #18 Joe Gibbs Racing Toyota was only a bit short of winning. Both Penske Racing drivers Brad Keselowski and Justin Allgaier found top-5 finishes on the Nashville Superspeedway. Finishing 4th, the #12 of Allgaier bested his Sprint Cup racing teammate Keselowski driving the #22 Dodge by the single position. Beaten by his younger teammate, Keselowski was at least able to finish in front of arch-rival on-track Carl Edwards. Edwards' #60 Valvoline Ford, placing 6th on the day, was the only Roush-Fenway Racing runner to go incident-free through the 225 lap distance. In 7th place, Scott Wimmer brought the #7 JR Motorsports Chevrolet across the finish lane for the season's best effort. Leading 18 laps, Wimmer will step aside from his driving duties with JR Motorsports last week at Phoenix as Landon Cassill takes over the #7 ride for 4 NASCAR Nationwide races. After 5 races, the NASCAR Nationwide Series season driver's standings has five drivers within 61 points. Carl Edwards leads the group with just 16 markers separating him from Brad Keselowski. 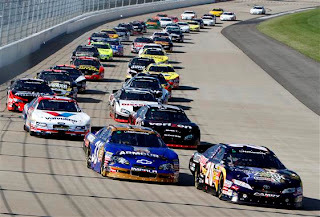 Next week, the NASCAR Nationwide Series rejoins the NASCAR Sprint Cup race weekend at Phoenix International Raceway.